Field school students use a laser transit to record features found during the excavation. The following webpage describes the results of the 2003 field season. Click on the weblinks to hear the Werowocomoco Research Group, landowners, and Virginia Indians describe their impressions of the first field season. The results of the archaeological survey of Werowocomoco revealed a site upwards of 50 acres. Artifacts recovered during the survey – predominantly Native pottery and stone tools – echo the outlines of a dispersed community dating to the centuries immediately prior to Jamestown’s settlement, a community that continued into the colonial period of the early 1600s. Most of the Native ceramics recovered were tempered with crushed shell and impressed on the surface with fabric textures (known as Townsend fabric-impressed pottery) or with linear stamping (Roanoke Simple-stamped pottery). These pottery types as well as triangular, stone arrow heads (“projectile points” to archaeologists) date the site to the years between A.D. 900 and the early 1600s. Together these centuries comprise the Late Woodland (A.D. 900 - 1607) and Contact periods in Chesapeake history. During these years Native communities throughout the Chesapeake region began raising corn, beans, and squash and settled villages with 50 or more residents along the banks of large rivers. Traces of copper and glass beads found in surface collections at the site record the Powhatan Indians’ trade with English colonists – early colonial encounters at Werowocomoco documented by John Smith and other colonists in written accounts of the period. With an archaeological survey completed, the WRG recognized the importance of informing the Virginia Indian community about the site and its likely identity as Werowocomoco. After consulting closely with the Virginia Council on Indians and the individual tribes, we learned that members of the Native community are particularly intrigued by Werowocomoco’s long term history, including its history prior to Jamestown’s settlement. Other members of the Virginia tribes expressed an interest in how the Powhatan chiefdom came into being and how it developed over time. Since Werowocomoco represented the Powhatan chiefdom’s political center in the early days of the colonial era, the site offers an ideal place to study the chiefdom from a community-based perspective. The WRG research team is also intrigued by the ways in which Powhatan-Anglo interaction at Werowocomoco shaped the Contact period history in the Chesapeake region. Eventually we hope to understand Werowocomoco’s changing “cultural landscape” (i.e. the physical and social layout of the village) during the years before and after Jamestown’s settlement. As a center of considerable Native authority in the Chesapeake, Werowocomoco’s cultural landscape likely reflected the village’s status as a place of power. - How well-preserved is the archaeological record at Werowocomoco? - What historical sequence of occupations is reflected in the site’s archaeology? - What can we learn about the overall layout of the Contact period village? 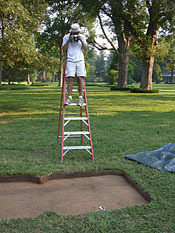 An initial step in archaeological fieldwork involves evaluating a site’s “integrity”, or whether the archaeological evidence remains intact or not. We knew from the pottery and stone tools recovered during the archaeological survey at Werowocomoco that the site was large, but we did not know whether the remains of the village were still intact. Most of the artifacts recovered by the survey came from the top foot of soil, what archaeologists refer to as the plow zone. This layer of soil contains some of the richest artifact deposits at the site, but it has also been churned up by several hundred years of agricultural plowing that began when English colonists seized Powhatan lands for tobacco farming during the early 1600s. Though artifacts found in the plow zone are informative, we are particularly interested in finding deposits below the plow zone untouched by recent agricultural practices. 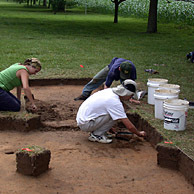 Beneath the plow zone in some village sites in the region archaeologists have found the remnants of hearths and storage pits that provide a record of daily activities in a Powhatan village. Small stains in the soil left by the posts of Powhatan houses also provide a sense of how Native communities organized their living space within a village. Native houses were constructed of wooden frames of saplings covered by woven matts for the walls and roof. Such evidence of hearths, storage pits, and houses – referred to as “features” by archaeologists – represents some of the most informative evidence from an archaeological site. Field school students excavate a test unit near the river. 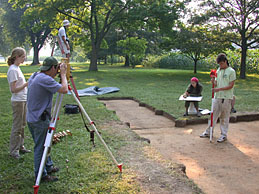 A second initial step in archaeological research involves understanding the history of occupations evident at a site. As an inviting location from the earliest periods of Native history in the Chesapeake region through today, the site contains a complicated sequence of occupations. Understanding this sequence was a critical step toward addressing the larger questions of Powhatan culture and history. A third step in archaeological research often involves efforts to understand the changing organization of space in a community. The spatial arrangements of daily activities within Native settlements such as Werowocomoco were influenced by natural surroundings, including topography, soils, and adjacent streams and wetlands. Over the course of thousands of years, Native residents on Purton Bay altered this natural setting by raising houses and constructing other features that formed the settlement’s “built environment”. This built environment influenced the ways that village residents carried out routine, daily activities such as cooking, pottery production, and stone tool manufacture. Archaeologists are keenly interested in the ways that such cultural practices, natural features, and the built environment influenced one another in a community like Werowocomoco. Our approach for addressing these research questions at Werowocomoco included test excavations in four different areas of the site. Two of these were located 1000 feet from Purton Bay in a pasture, an area that contained a concentration of Native pottery. Early historical accounts of Werowocomoco mention that Chief Powhatans house was located a considerable distance from the river, raising the possibility that the pasture contained evidence of such a structure. A third area, located on the river front, also contained a high volume of Native artifacts. A typical Powhatan village settlement included residential areas located in such areas lining banks of rivers. Finally, we tested an area about 500 feet from the river and in the midst of a field currently planted with corn. This area contained a lighter scatter of artifacts, raising the possibility that this marked the edges of residential settlement in the village. Our field research quickly revealed that the archaeological deposits at Werowocomoco have remarkably high integrity. In all of the excavation areas we found intact evidence of Powhatan village life. Each one of our excavation blocks uncovered evidence of hearths, posts, or pits. The first area in the pasture we excavated included evidence of both a Native and an English colonial presence. The English colonial occupation appears to be related to a house site dating to the early 1700s. Large pit features, including one likely cellar pit, and dense concentrations of English colonial ceramics, nails, and glass, appeared in this area. In the same vicinity, more subtle evidence of a Powhatan Indian presence appeared in the form of small post stains, Native pottery, and stone tools. Though the early English colonial occupation of the site is not central to our research, it entails a critical part of the site’s history. It is not uncommon in the Chesapeake region to find archaeological indications that the earliest English colonial settlement in a location occurred in the same physical space as a Native settlement. In some instance this sequence reflects colonial settlement in areas previously cleared of trees by Native residents who had recently abandoned the location. In other instances, this evidence reflects the colonial seizure and re-occupation of Native lands. Field school student Justin Arrocho photographs a test unit after the plowzone was removed. The second excavated area in the pasture revealed fewer English colonial artifacts and more Native materials. Upon excavating through the plow zone, we also uncovered two linear soil stains that ran parallel to one another. The stains were roughly three feet wide, two feet deep, and separated by a distance of about 6 feet. They extended beyond the length of our excavation block of 25 feet. These features, that appeared upon excavation to be refilled ditches, contained only Native artifacts. A few, scattered post stains appeared within or immediately outside of the ditch features. Within one of the ditches an area of charcoal, burned soil, fire-cracked rock, and Native pottery marked the presence of a hearth. Though not unprecedented, such ditch features are highly unusual for Native sites in the region. In fact, the evidence of an English colonial occupation in the same general area of the site raised the possibility that the ditches were actually constructed by early English settlers. The absence of any identifiably English materials in the ditches and the presence of Native pottery and stone tools argues for the interpretation that the ditches were constructed by Native residents of the site. The ditches are particularly intriguing given that the site was the capital of the Powhatan chiefdom. Whether the features were created as part of a defensive palisade, to demarcate space in a special area of the site, or for some other purpose is not yet clear. Along the river front in the third excavation area, our investigations confirmed the impression that this area contained the highest density of Native artifacts on the site. Pottery, stone tools, and fire-cracked rocks from hearths indicated that this area saw a range of activities associated with residential space. A piece of copper from this area may reflect early seventeenth century trade relations involving Native residents and English colonists. We also uncovered a dense scatter of post stains in this area of the site, most of which are likely related to the construction of Native houses. The final excavation area in the cornfield uncovered layers of soil beneath the plow zone that contained Native artifacts. Such cultural layers rarely survive intact and unplowed within archaeological sites in the region. The buried cultural layers at Werowocomoco are particularly intriguing since they appear to record a sequence of living surfaces dating to the site’s late precontact and early colonial occupations. One of these living surfaces included post stains which contained sherds of Native pottery, an encouraging sign of intact architectural evidence at the site. While the first season of excavations at the site was remarkably successful, we still have much more excavation and analysis to do before we begin to have a firm understanding of the site’s long-term history. We have learned that the site contains intact features and living surfaces from the late precontact through early colonial eras. Most of the artifacts and features we identified date to the Late Woodland and Contact periods that comprise the site’s Werowocomoco era. It appears that the core of residential settlement and domestic activities is located on the river front. We see indications that this residential living space extended at least 500 feet into the corn field, pointing toward a large, dispersed community. Finally, the unusual ditch features located in the pasture provide a tantalizing glimpse of the demarcation of space in the settlement.